I just got back last night after spending the weekend in South Carolina celebrating Thanksgiving with my family. We watched the parade and enjoyed Thanksgiving dinner on Thursday. Then on Friday we went to the movies to see The Blind Side (and tried to spot my sister in the crowd as an extra). 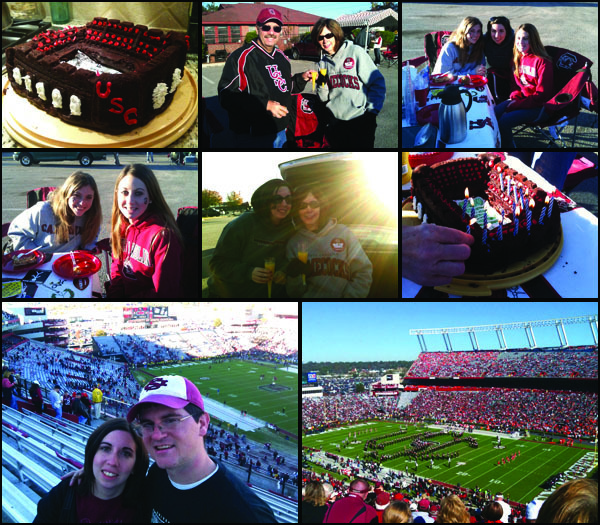 Saturday we went to the Carolina-Clemson football game, celebrated my dad's birthday and I got to see a few friends from college. I had such a great time! Since I took a break from blogging for a few days, here are things I wanted to share from the weekend. The Black Friday Print Sale is still going on. Save 25% off any print from your wedding or photo session online gallery. This sale only happens once a year! Sale ends 5:00 PM EST Tuesday, December 1st. I was excited that Susan of True Blind Faith featured some of my photos on her blog on Friday. Check it out here! On Saturday my family and I went to the Carolina-Clemson game. It was a great way to end the weekend, especially since the Gamecocks won! My dad's birthday fell on the game day, so my mom made a stadium cake for his birthday cake to bring to our tailgate. Of course! :) It was a fun weekend!